Tracking the pacesetter Farrell up to the far turn in Friday's Grade 1 La Troienne, Gary Barber, Chester Prince and Baccari Racing Stable's Salty appeared to drop out of the contest. Jockey Tyler Gaffalione continued to save all the ground at the rail, however, and the 4-year-old daughter of Quality Road re-rallied in the stretch to earn her first Grade 1 victory. Trained by Mark Casse, the 4-1 chance Salty covered 1 1/16 miles over Churchill Downs' fast main track in 1:43.78. The 3-5 favorite Abel Tasman, last year's Kentucky Oaks winner, wound up finishing fourth. As expected, Farrell broke sharply and went straight to the lead. She did bear out just a bit at the start, slightly impeding Abel Tasman, but was quickly four lengths clear of the rest of the field. Farrell led through steady fractions of :24.70 and :48.86, tracked by Salty at the rail and Streamline at the outside. Martini Glass was close up fourth, while Abel Tasman was tracking from fifth. Approaching the far turn, Farrell's lead had diminished to a single length as Salty and Martini Glass began to close the gap. Martini Glass made a big move as she rounded into the straight, but Farrell bounded away by two lengths at the top of the lane. Gaffalione had delayed his rally on Salty at the rail, and gave her her cue at the quarter pole. Salty fought down the length of the stretch, and in the final sixteenth of a mile was able to get past a tiring Farrell. Salty passed under the wire about 1 1/2 lengths ahead of Farrell, while Martini Glass checked in third. Abel Tasman was relegated to fourth in her first start off the layoff. Bred in Kentucky by Seclusive Farm and Prince Farm, Salty is out of the winning Dixie Union mare Theycallmeladyluck. She won the Gulfstream Park Oaks last season to earn a spot in the Kentucky Oaks, but wound up finishing fifth to Abel Tasman. A year later, Salty turned the tables on that rival to triumph in the La Troienne, bringing her career record to 4-2-2 from 11 starts, with earnings of just under $700,000. 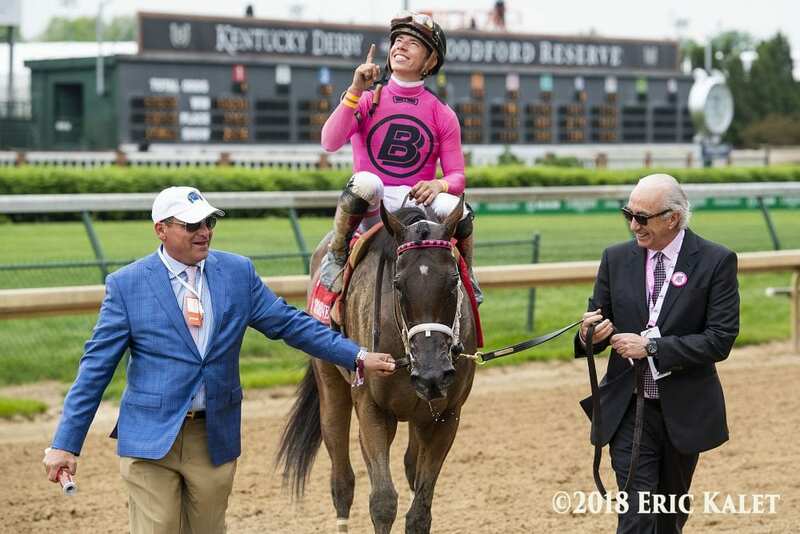 This entry was posted in NL Article, Racing and tagged Abel Tasman, Baccari Racing Stable, chester prince, churchill, churchill downs, farrell, gary barber, kentucky oaks, La Troienne, Mark Casse, Quality Road, salty, Tyler Gaffalione by Paulick Report Staff. Bookmark the permalink.